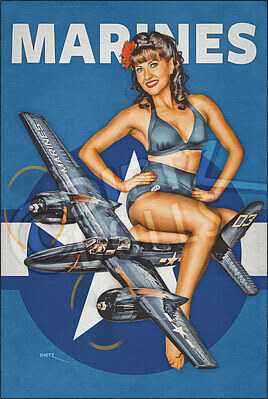 Airbrushed style pinup photo featuring model Shauna, the US Marine Corps, and the Grumman F7F Tigercat! Introduced in 1944, the Grumman F7F Tigercat served with both the US Navy and US Marine Corps and was the very first twin engine fighter aircraft used by the Navy. This large aircraft was activated too late to see combat in World War 2, but went on to serve in Korea as a night fighter and attach aircraft. With a crew of two and a maximum speed of 460mph, the Tigercat had four 20mm cannons and five .50 Cal machine guns. Only the United States used the Tigercat, and after service in Korea it was retired 1954. After military service, many Tigercats were used as water bombers fighting fires in the 1960s-70s.